Drumbeats from Jamie inform us about an aspect of OURstory that is rarely told. The Smithsonian has a current exhibit of posters and one of the sections is on wartime propaganda. 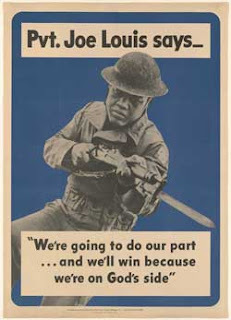 Two of the posters in the section on World War II feature African Americans (one with a black sailor and the other with Joe Lewis). Considering the segregation of the forces it was an interesting recruitment incentive. The images are truly interesting. Asante sana to Jamie for sharing this historical tidbit. We welcome referrals from villagers to other little-known aspects of Black history.